They want our campaign outlawed! Australia’s coal industry is pushing the Government to make our fossil fuel divestment campaign and other boycotts illegal. We need your help to push back. The Minerals council says it wants to stop the “small number of noisy extremists creating the false impression that the community does not support Australia’s second-largest export sector”. 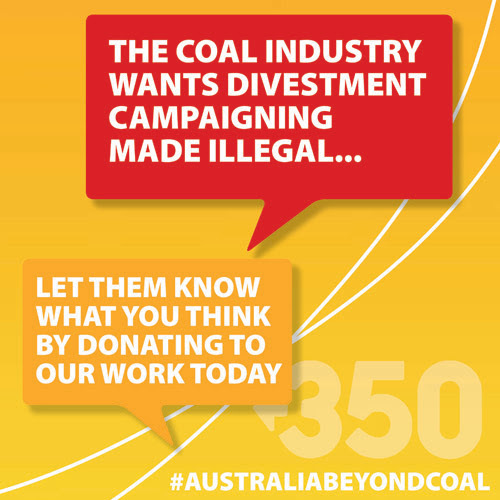 Can you chip in $10 or more to help us grow our divestment campaign in Australia? True, we are noisy but we are not small in number. And the real extremists are the fossil fuel companies that are willing to profit from the wreckage of our country and climate. We think it’s pretty reasonable to try to maintain a planet somewhat like the one we were born into. We need to show Australia’s fossil fuel industry and our Government, that we’re not backing down from this campaign. Instead, we’re turning up the heat. Chip in today to help us do just that. As Gandhi said: “First they ignore you, then they laugh at you, then they fight you, then you win.” No longer are we being ignored. No longer are we being laughed at. Now, the fight is on. We can win this, but we need your support. 1. Chip in to super-charge our campaigning. 2. Sign and share our petition demanding the protection of our right to divestment campaigning — click here. *** A stranded asset is one that has become obsolete or non-performing, and must be recorded as a loss. Many financial experts believe that assets such as coal, oil and gas are likely to become stranded due to the global commitment to keep climate change at or below a 2°C which will require a rapid move away from polluting energy.